On Thursday, February 26, the Virginia legislature agreed to pay $25,000 in compensation to those who had suffered forced sterilization during the Commonwealth’s decades long adventure in eugenics. 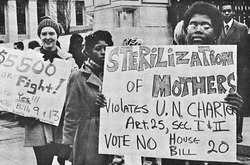 From 1924 to 1979, over 8000 people were involuntarily sterilized under the Virginia Eugenical Sterilization Act. It’s believed that 65,000 people nationwide were forcibly sterilized, and so, at over 12% of the total, Virginia holds pride of place. But there’s more. Virginia was the model for many states across the United States and for the German Nazi eugenics program. The line from Richmond to the Third Reich is direct. More than a fifth of those sterilized in Virginia were African American, and more than two-thirds were women. Virginia’s longstanding war on Black women took many shapes, and the argument was always security and the well being of something called society. In 1927, the U.S. Supreme Court upheld Virginia’s sterilization program. In the words of Justice Oliver Wendell Holmes, “Three generations of imbeciles are enough.” By enough, he meant too much. Virginia’s sterilization program sat comfortably at the intersection of gender, race, class, disability, and confinement. The overwhelming majority of those sterilized were “patients” of state institutions. They weren’t patients; they were prisoners. Does healing begin this way? The compensation is a step in the right direction. At the same time, the survivors number only eleven. More to the point, what of the system of law, medicine, education, and State that supported the forced sterilization of over 5000 women, all in the name of preserving the health and well being of something called society? That healing has not begun, not while so many of their sisters, nieces, grand nieces, and the list goes on, languish in prisons and jails across the Commonwealth, and across the nation, today. The kind of healing of which Delegate Hope speaks and for which he yearns cannot be purchased. It is not for sale. It must emerge from sustained recognition of responsibility combined with recognition of the subjects of this history. Women. Black women. Black women living with disabilities. Poor Black women living with disabilities. That healing has yet to begin. These comments are from Sam Barlow, one of the co-defs of Sharon Wiggins: “Eugenics: a science that deals with the improvement of hereditary qualities of a race or breed. Virginia never intended to improve anything nor anyone. Genocide would be more fitting here. So, if you must put a price on the survivors give them a million dollars to live off the interest. This will never heal the ongoing, inherent institutional racism nor pay for the loss of reproduction, but its a whole lot more than counseling services” Sam Barlow has been incarcerated since 1968 at the age of 18 in Pennsylvania. He stole two cars to facilitate a bank robbery. Thanks for sharing the important information. Thanks to Ellen Melchiondo for sending along Sam Barlow’s reflections. There is no amount of money that can compensate for not only the individual suffering but also for the genocidal program. You are absolutely right. Thanks, Anwara, for your response. It wasn’t just women who were sterilized. 62% of the victims of Virginia’s forced sterilization law were female, 38% were male.